Mezzanines: How Can They Help Make Your Operations More Efficient? If you have anything to do with manufacturing, then you are very familiar with mezzanines. A mezzanine is going to give you what is called a “floor between a floor.” Since you can purchase these pre-fabricated structures for pretty cheap, it makes sense to do so if you could use the extra space. Manufacturing plants use them for all kinds of reasons, usually to help make operations more efficient. And, offices can be located on mezzanines when office space cannot be implemented elsewhere. Also, warehouses use them to help make storage space for all kinds of different products. While warehouses do make money handling product and doing the shipping and receiving, there are many issues that can arise in which a mezzanine would be extremely beneficial to provide space to the company. For instance, expansion is one reason why a warehouse would want to have mezzanines so that they are able to accommodate that expansion without building onto their existing structure. And, another reason would be that they have too much product that has not moved like it should. They need to be able to store old products, defects or anything like that to make room for the product that is actually raking in the profits. Now, when you are thinking of a mezzanine, don’t think of the “floor between a floor” as one that completely separates the actual floor from the ceiling. Instead, the structure usually protrudes from the wall and then stops at a certain point as to abide by OSHA regulations and to not completely separate the actual room in which it resides in two. Mezzanines allow you to make as much room for what you need to do on each floor they are used. If your business, warehouse or manufacturing facility is more than one story, you can still have mezzanines on other stories as well. Generally speaking, most places stick to having them on the ground level, but they can be added to other stories according to regulations. You have probably heard the word “mezzanine” from study of history centuries ago or when you buy tickets to a sports games. This word describes those tickets on the 2nd deck but the first few rows of seating. Think about that for a minute. This means that you are up above the actual first level, but you still have premium seating because you’re hanging right over them and the field itself. You see how architecture has really helped improve space with this one simple way of thinking? So while a mezzanine isn’t an actual part of your existing structure already, they are made top-quality and according to OSHA regulations, and there will not be any safety concerns. And, since they are prefabricated and added to your existing structure, you can tell the company in which you’re purchasing them from the guidelines that you need. That’s right! 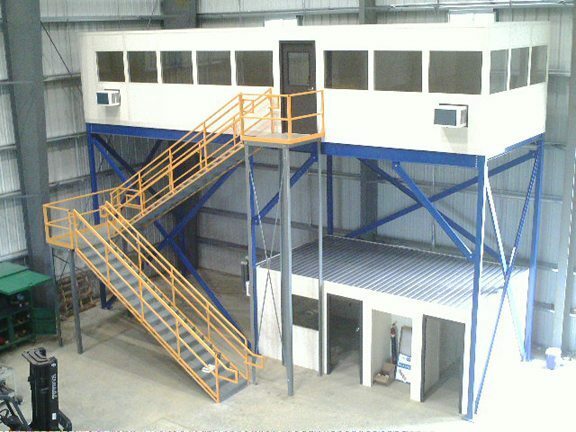 That means that you can get custom-built mezzanines according to your specific needs. And, of course companies that offer this also offer custom-built staircases leading up to the mezzanine and also other types of prefabricated structures like modular and office buildings. Sometimes people even combine those two efforts and create a mezzanine for more office space. In a manufacturing facility I worked at one time, there was a certain man who held a position for years. Instead of working in the main office, he had a modular office built into a mezzanine among all the workers. His title was the Scheduler/Planner, and he would use all the formulas to create spreadsheets for what we needed to run and when. Now, the office workers worked inside the main office, and all the supervisors worked inside their own existing floor offices. But, there was no office space for him, and his position was very important. So, he ended up having the largest office of all! Now that you know what a mezzanine is and have had examples given to you, you’re going to start noticing them more in public in different places. And, if you’re a business owner and looking to add space for specific reasons to your manufacturing facility or warehouse, then you know that top-quality mezzanines are the way to go. They save you money, and they will ensure that you are going to get everything you need done efficiently to maximize your profits. While these structures aren’t permanent, that isn’t to your detriment but instead to your advantage. They can be taken down, moved, reshaped or whatever you need in the future. And, they cost much less than adding on to your actual structure inside or outside. Panel Built is one of the industry leaders in these and other prefabricated structures, so if you’re looking for more information on them or to get some ordered for your own operations, you should check their business out online.